Is the Entire Market Rigged? Long before I started working full-time in the financial industry, I used to work for a friend’s orchard company selling apples at nearby farmers’ markets. One Saturday, while stationed in Old Town San Diego, a scholarly looking man in his 50s and I began conversation over a few fresh cut samples. “So what do you do?” I asked. “No”, he said with slight disdain, “I write on the financial markets”. His answer gave me the feeling that fiction was silly and useless. “Oh neat, I’m thinking of working my way into the financial field myself, any suggestions?” I just started working at a financial firm part-time. The prospects looked pretty good and I liked the company. This was finally somewhere I could see myself long-term. “Don’t do it. The entire system is rigged. It’s just a big casino and it’s all going to crash down like a house of cards, probably soon. You’d be better off picking another line of business.” I felt my vision of future success and security whisked away from me. Maybe he’s just one person that lost a lot of money on a bad investment, I thought to myself. “Believe me, I’ve written books on this”, he said with an air of conceit before purchasing his bag of apples and walking away. I managed to scribble down his name and the title of his most famous book before he left but, of course, I never read it. Why would I want to read something that just throws a bucket of cold water on my new found dreams anyways? Besides, he was kind of a jerk. Much has happened since then. Perceptions change, new information arises. With my background in math and a strong affinity towards chaos theory and complex networks, I had previously operated under the assumption that the stock market was a highly dynamic system consisting of billions of interdependent parts that collectively operate at a level beyond human predictability and control. Thus, the idea of a person or group of people being able to rig the system seemed a bit far-fetched. At least, that was until relatively recent developments and research. Not too long ago, news came out that scientists at MIT developed a computational algorithm that can determine on average the number of nodes that need to be influenced in order to control highly complex systems. Surprisingly, the number turned out to be fairly small. It’s like a Hollywood political thriller come true: a handful of people lurking in the shadows, controlling the minds of millions. New research reveals that it’s possible for a few individuals to enslave an entire network, even if they aren’t highly connected themselves. Scientists have figured out how to identify the nodes—the points that link to other points in a network—that when tweaked can control the entire network. The research, published in the May 12 Nature, might lead to more secure power grids, tricks for controlling the metabolic processes of cells and marketing campaigns that spread like the plague. This is slightly alarming. Rig 20% of the nodes in a network and you’re in control. So, what kind of network is our global financial system? Is it sparse or relatively dense? If you use the number of major exchanges and the dollar amounts traded through each as your metric, it would appear that it is extremely dense—that is, largely concentrated at a few key nodes. For example, given the total trading value of the top 18 global exchanges—a good representation of all trade worldwide—of the $60 trillion total, 33% is traded through the NYSE Euronext alone. 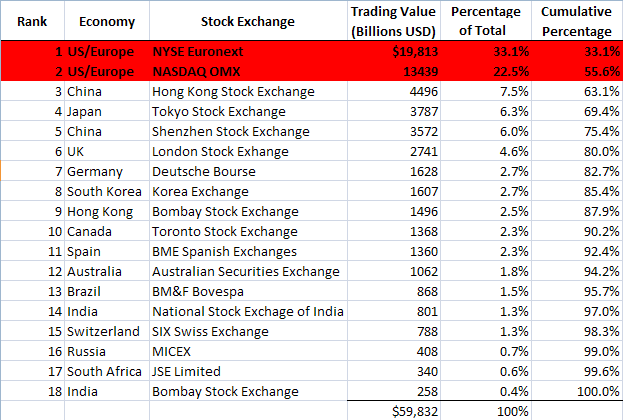 If you add the trading value of the NASDAQ OMX, you now arrive at 55%. Thus, we see that in terms of dollar amounts, the top two exchanges in the world (for-profit companies I might add) comprise the majority of all global trade. Going by the research out of MIT, if only 20% control using key nodes in a network gives you the ability to rig the entire system, then theoretically you'd only need to control three-quarters of the NYSE and less then half of the NASDAQ and the entire market is under your influence. This begs the question then, how? Unknown to most people, there’s a vicious arms race taking place in the financial world; except, it’s not over stealth helicopters and long-range missiles, but over petaflops and microseconds. Billions of dollars are being poured into the power of automated trading by the largest investment banking firms across the U.S. and worldwide. Just to give you an example of how influential this market has become, in 2009 a study was done by Aite Group showing that high-frequency trading (HFT) firms represented only 2% of the 20,000 operating in the U.S. However, they simultaneously accounted for 73% of all equity trading volume! That is, only a meager 400 high frequency domestic trading firms drive the overwhelming majority of stock trading done in the U.S., which as I already pointed out, is where a majority of global trading takes place. Given the above, does it appear the system is rigged? Yes…and no. You see, most of the trends taking place are perfectly legal...so far. But don’t believe it will remain that way for long. Since HFT has become such a dominant feature of our modern markets we’ve had one near major meltdown occur in just minutes, periodic mini flash crashes in various stocks and, now, in commodities. An economic system can tolerate only so much volatility, especially in the prices of its raw materials, before major disruptions begin to occur. At a certain point the volatility of commodities and the stock market driven by millions of computer programs all viciously competing for penny spreads will overwhelm the system. Recently, Obama addressed the problem of sky-high gas and oil prices on speculators. But who are the speculators? Most assume he’s referring to people. I don’t. When you have an entire arsenal of trigger-happy trading platforms waiting to aim their payload at the slightest hint of bullish or bearish news, things explode—up or down. On top of that, feeding frenzies ensue where computers sniff out other large orders and pile in, shredding apart every piece of profit until demand dries up. So far, the issue of our markets being rigged by this new found technology is just beginning to get some coverage in the news. The one good thing about the Flash Crash is that it got everyone’s attention. Regulators had to think something up quick. The best they put out was circuit breakers, which aren’t really a solution at all—just a temporary rig until they create a new regulatory mechanism. In the end, government and regulatory agencies must be able to out-compete prevailing technology by building something smarter, faster, and more pervasive. Something that can proactively recognize market-shaping patterns before they reach a tipping point. Of course, such a system cannot be constrained by the speed or limitations of human beings—it must be able to act and respond within microseconds. So, the question of whether or not the market is rigged is not necessarily one of great interest anymore. It's what’s going to be created in response that I dread most. Perhaps it is a Brave New World after all.